We’ve all faced the prospect of making life-altering decisions. Where do I go to school? What kind of job should I pursue? Whom should I marry? Should I get married? What about children? Oh, and will I be a follower of Jesus? We started our Lenten journey last Sunday with Mark’s brief introduction to the beginnings of Jesus’s ministry. 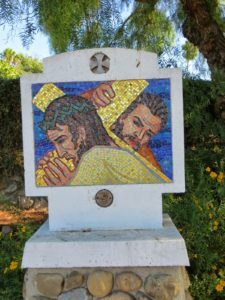 We watched as Jesus was ordained at his baptism, received his orientation in the wilderness, and then returned to Galilee to start preaching the good news of God’s kingdom. That story has moved along quite a bit in our reading today from the Gospel of Mark. Jesus has had some success as a preacher and as a healer. He’s gathered a group of disciples, healed the sick and the injured, fed the multitudes, and he has caught the attention of the people. If Twitter existed back then, news of his exploits would be trending. When we catch up with Jesus in Mark 8, he is explaining to his disciples what was about to happen with his ministry. This conversation takes place not long after Jesus had received an update from the disciples about what people were saying about him. As part of that earlier conversation, Peter boldly declared that Jesus was the Messiah. It would seem that Peter had been paying attention, and he believed he was on the winning team. But now, Peter’s hopes and dreams are shattered because Jesus starts talking about suffering and death. That’s not what he had signed up for, or so he thought. Evidence alone produces faith, or testimony is all that is necessary to faith. This is demonstrably evident in every case; and therefore the certainty felt is always proportioned to the character of the testimony produced [Compend of Alexander Campbell’s Theology, Bethany Press, p. 26]. Disciples have always prized the reasonableness of our faith. If you get the evidence right, then you can have certainty of your relationship with God. Yes, we were born as part of a revival, but these early Disciple leaders didn’t think it was helpful to get overly dramatic and shout and yell. No, our Disciple founders believed in the value of plain logic!! Being that I’m a Star Trek fan, and in remembrance of Leonard Nimoy, who died this past week, I’ll just say that ours is a faith that would appeal to Mr. Spock! Of course that’s one way of doing things. You can get the evidence together, believe it to be true, and then you can belong to the group. Or, maybe faith will come in a different way. Instead of believing in order to belong, you will belong and in the course of belonging you may come to believe. I’m thinking that this is what happened with Jesus’ disciples. He invited them to walk with him as he engaged in his ministry of proclaiming God’s realm, and as they walked with him, he would teach them the ways of the kingdom. Every once in awhile he’d ask them – are you ready to make a decision? Are you in this for the long haul? When Peter boldly proclaimed Jesus to be the Messiah, he thought he understood who Jesus was. He hoped that Jesus was the one who would lead his people to victory over the Romans. What Peter didn’t expect to hear from Jesus was that “the Son of Man must undergo great suffering” and even be killed. Now, that is not the logical way to go about establishing God’s kingdom. Suffering and death aren’t supposed to be part of the deal. So Peter rebukes Jesus. He grabs Jesus and shouts at him because he simply can’t and won’t receive this word. Peter knows best. Jesus must be mistaken. In this story, Peter becomes the tempter. He offers Jesus an easy way out. But Jesus won’t accept Peter’s word of temptation, and so he in turn rebukes Peter. He even calls Peter Satan. That’s strong language. From this exchange, it seems that Peter will have to belong a bit longer before he’s ready to decide. He’s not yet sure if he’s all in! The other day I met with the pastor of the local Antiochian Orthodox Church to set up a TIG event in April. It was a very insightful conversation. As you may have heard, the Christians in Syria and Iraq have been targeted by ISIS. Many have been killed and many have fled. Syrians of all backgrounds, but especially Christians, have been leaving their homelands. During our conversation, Fr. Antypas passionately spoke of the dangers facing his community in Syria, as well as other Christian groups across the region. To follow Jesus in Syria is to face the possibility of dying for your faith.Jesus understands their suffering, because he understood that the path he was called to take would lead through the valley of death. Following Jesus isn’t always easy! In fact Jesus called on his disciples to take up the cross and follow him. If they were going to find life they would have to first lose it. Good Friday comes before Easter. What Jesus is talking about is a good illustration of what David Cartwright has called the paradoxical nature of Jesus’ teachings. This is the “two-edged sword” we talked about in the Wednesday study group, as we read David’s book Wounded by Truth – Healed by Love. Apparently, to follow Jesus means taking up the same cross that Jesus took up. Cheryl and I recently watched the movie McFarland USA. Cheryl wanted to see it because it takes place in the Central Valley of California, which is home turf for her. It’s the story of a group of young men whose life is defined by working in the fields. It’s hard work and pays very little, but it provides a living for the family. Of course, everyone has to work. You work before school, after school, and on weekends. School is secondary, and there’s no time for extracurricular activities like running cross-country. Then along came a coach who noticed a group of young men who could run fast. They also had been toughened by working in the fields. But could they win races? Winning races required hard work and a commitment to the race even when it became painful. The movie is based on a true story, though the writers take great liberties with it. What is true in this story is that this group of young men, whose futures looked bleak, won the state cross-country championship. Not only that but against all odds they graduated from high school, and most of them went on to college. They could run like the wind, but in their first meet they discovered that speed alone wouldn’t get them victory. You see, the course included running up steep hills. If they were going to win, they would have to conquer the hills. That took even more work and commitment, but rallied by their coach they did just that. In fact, according to the movie, it was Danny, the slowest of the runners who put everything on the line and pushed himself beyond anything he had done before, to bring in the needed time to win the championship. Are you like Danny? Are you willing to put everything on the line to follow Jesus? Is this decision time, where we play for keeps?